All college student Toby Elles wanted to do was eat a little snack before going to bed. He’d been out, drinking of course, and he needed nature’s perfect hangover food to keep him warm and help him sleep off his partying. So he got out the frying pan, threw on some bacon, and promptly fell asleep. 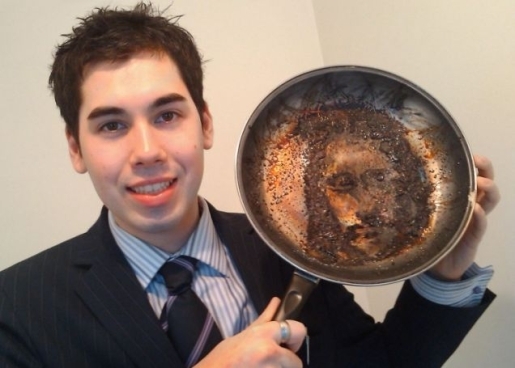 He awoke an hour later to the smell of smoke and a reproachful gaze from Jesus Christ, whose face appeared in the frying pan. I guess you could call that Greasus, huh? When they say Jesus is everywhere and in all things, they’re not kidding. He’s showed up on naan bread, in an old woman’s bruise, and is now taking over household appliances other than the iron. Young Mr. Elles has decided not to scrape the Savior off his frying pan, intending to take it back to Salford, Lancashire with him and put it in a display case or some other reverential location. No word on what he did with all that delicious burned bacon.